ELLSWORTH, Kan. (CNS) — Behind a fence trimmed with razor wire sits the white steeple of the Spiritual Life Center in the Ellsworth Correctional Facility. Across the empty yard, three small figures walk toward the only circular building amid a sea of sharp edges. Volunteer Chuck Huslig trails behind the black-clad figures of Bishop Edward J. Weisenburger of Salina and Father Joshua Werth on the way into the worship space. “I think there’s a tremendous need for these men to have more of a spiritual life,” said Huslig, who has been a Catholic volunteer at the facility since 2003. Huslig’s ministry began when he worked a rotating shift at a nearby refinery. He was one of three lay ministers who would visit the correctional facility. He said the current Year of Mercy gives him the opportunity to reflect on the corporal works of mercy, especially “visiting the imprisoned.” He credits eight years of parochial school under the Dominican sisters in Great Bend with instilling those values. When Huslig started volunteering, Masses took place only once a month. Huslig and the other retired volunteers hosted a weekly Communion service. After a while, the frequency of Mass increased to the first and third Wednesday. He held a Communion service on the other Wednesdays so the inmates could receive Communion weekly. In 2014 Carmelite Father Mathew Chacko, pastor of St. Wenceslaus Parish in Wilson, began saying Mass weekly for the inmates. 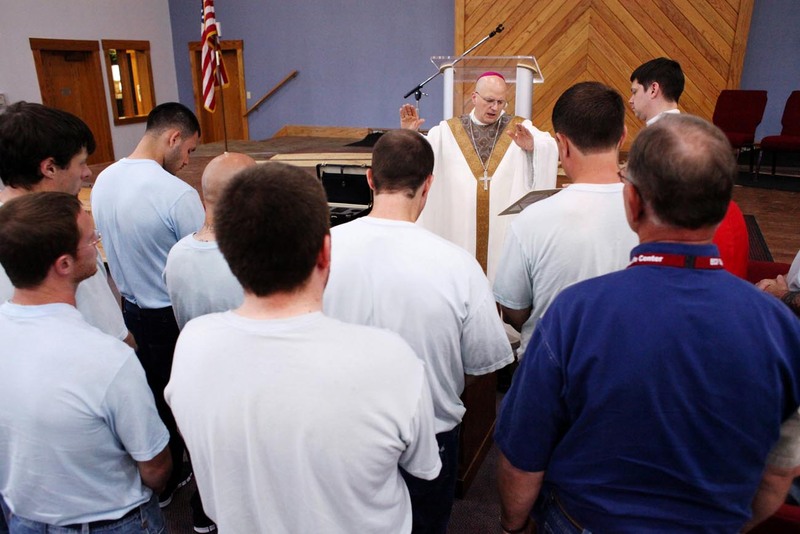 Dale Bailey, the chaplain at Ellsworth Correctional Facility, said before a priest came regularly, a few guys would attend the Catholic service. With Father Chacko administering the sacraments, it allowed Huslig to provide other forms of spiritual enrichment. In November 2014, Rite of Christian Initiation of Adults classes began in the Spiritual Life Center. “This was a jump into the deep end of the pool for me,” Huslig said. “I honestly had no qualifications. He consulted with Father Steven Heina, pastor of St. Bernard Church in Ellsworth, and obtained permission to use the materials from the parish’s confirmation class. The series includes 24 video lessons with discussion and supplemental reading. The class in the prison runs eight weeks. RCIA prepares adults interested in joining the Catholic Church. Huslig said many inmates he meets were baptized as an infant, but had no religious upbringing. Others might have been baptized in another religion, but are interested in joining the Catholic Church. Still others have no religious exposure, but are curious about the Catholic faith. “My first incentive was to catechize the fellas that were already baptized, but it didn’t take very long and I saw the fruits of fellows who had no Christian background whatsoever … the Catholic worship group spread the word,” Huslig said. There is no obligation to join after the classes, but he said many opt to become Catholic. On June 9, five men joined the church when they were baptized and confirmed. Two others were confirmed. In the 19 months since Huslig began RCIA classes, 11 have received both baptism and confirmation; and 17 were already baptized, so they received confirmation. The bishop visits the correctional facility a few times a year. He says Mass, which includes baptism and confirmation for the inmates who have completed the RCIA program. “It’s a very big deal,” Bailey, who is Baptist, said of the bishop’s presence. “It’s great to have him come in. 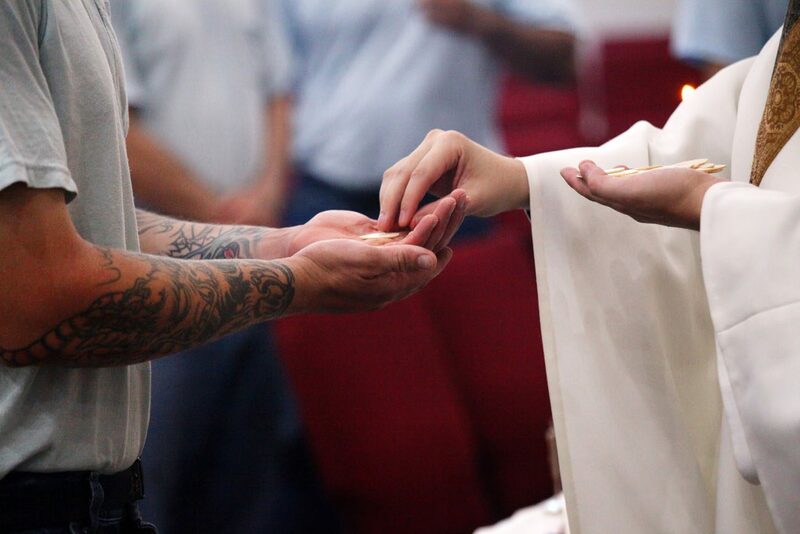 (The inmates) understand the value of having the bishop come and say Mass. Bishop Weisenburger said the prison ministry is important. The Spiritual Life Center at Ellsworth was built in 2004 to serve as a spiritual home base for inmates. With more than 9,000 square feet, six classrooms, a library and a sanctuary, the building serves 12 religions. While the building is in a state detention facility, the project was made possible through the efforts of volunteer time and donations. Money came via individual and corporate donations, as well as grants from private foundations. Inmates provided labor during the building process. Bailey said plans are under way to expand the current building to include rooms for GED classes, as well as a reintegration program by the Salvation Army. Fundraising is underway for the addition. Even though he spent many years working in a refinery, Huslig’s college degree was in social work and he worked in that field for a number of years. While Huslig meets the men during their incarceration, his focus is on their life after the correctional facility. Huslig is unassuming about his role in the correctional facility.